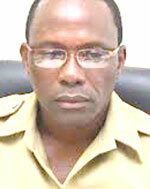 Deputy Commissioner of the Guyana Police Force (GPF), Paul Williams has indicated that the Force is ready to embrace the new technological era. Williams made this observation last week during the Force’s one-day career fair which was held at Police Ground, Eve Leary. He assured that whatever new technology the country is faced with, the force will meet the demand. Just a year ago the Police force has been equipped with drones to help combat crimes, and now ranks are donning body cameras as they patrol the streets. The police forensic lab also has new crime kits to help with crime scene investigation. Just recently a police official confirmed the introduction of the drone technology into its crime-fighting arsenal. The official said that drones were introduced last year. He said that the use of drone technology would have given the joint services the “aerial advantage” to locate the gangs that were often hiding out in coastal backlands during the crime wave. He also pointed out that drones were a much cheaper alternative to using a plane or other aircraft to conduct aerial surveillance. Back in 2006, police had hired a plane in their bid to locate the hideout of ex-cop Neil Bovell, who had killed three people, and was abducting women and taking them into the Stanleytown, West Bank Demerara backlands.